We have been snow bound in the house for the last three days! Very unusual for the valley floor to get almost a foot of snow and actually have it stick around! Our city pretty much shuts down when we have any kind of snow, not like back East when they keep the city running and schools open! It’s funny to watch the news and see what a “big deal” they make of the weather. The produce at our grocery store was even wiped out, not one potato to be seen. I have never seen the shelves so bare and empty, I felt like I was on set of a zombie movie! They are even naming this storm the #snowapocalypse of 2014. Too funny! Well, having a chilly wintery weekend, I decided to make a warm quiche for breakfast. We had mushrooms, onions, garlic, rapini, chicken sausage and rosemary on hand. Perfect for a winter quiche. 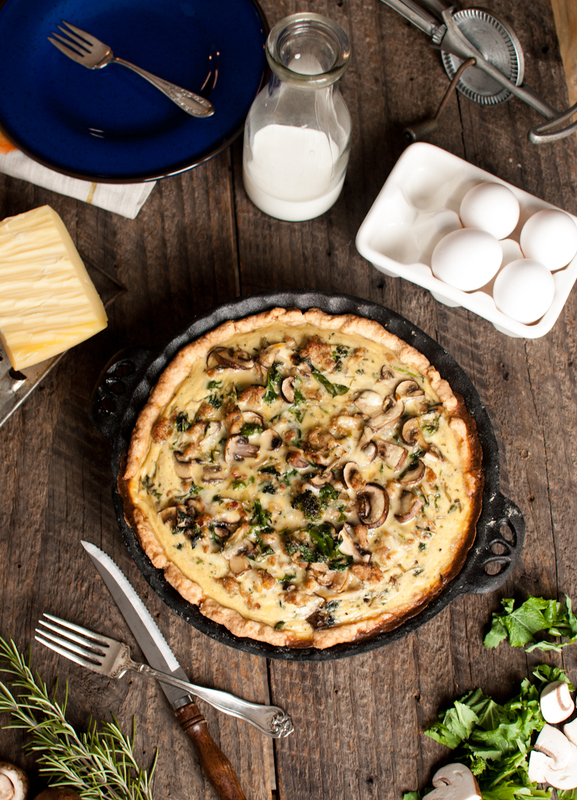 We love cooking breakfasts on the weekend after the hectic week is over, and quiche is right up there with our favorites. How can you not love creamy baked eggs in a buttery flaky pie crust?! 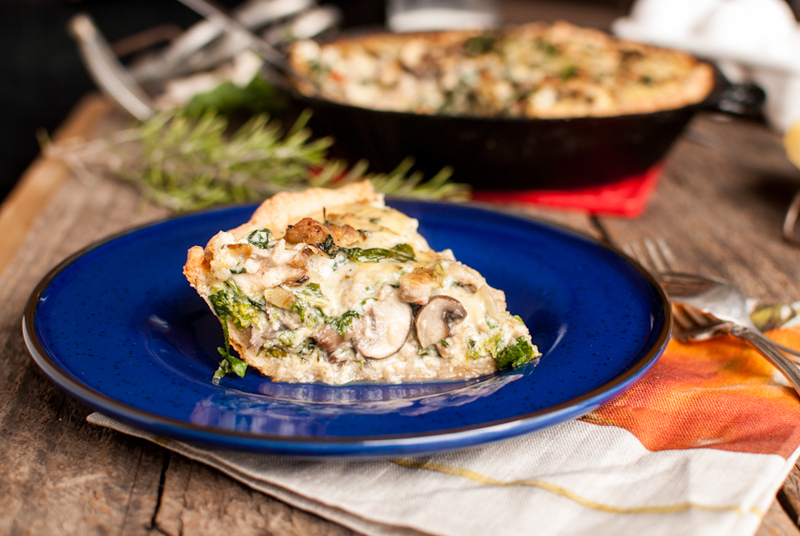 This quiche gets your weekend morning going just right, even if you are snow bound in the house. Anyone up for a snowball fight? 1 9 inch pie crust, blind baked. While your crust is blind baking, in a large skillet heat a Tbsp of olive oil over medium heat. Sautee onion and garlic until soft and fragrant. Next add the sausage and cook until no longer pink. Now add to the same pan, the mushrooms and rapini, and sautee until cooked. In a large bowl, whisk the milk, eggs, rosemary, salt and pepper. Fold in the vegetable/sausage mixture. Then fold in the cheese. Your crust should be ready bu now, pour in the egg mixture into the hot crust. It will be very full, but will cook down a bit. Bake at 375 degrees for 25-30 minutes, until middle is set. In a food processor, mix the flour, sugar and salt. Add the cubed butter and pulse until mixture is the size of peas. Next add the water and lemon juice while pulsing. Crust mixture should be crumbly, but not to wet. Form into a disc and wrap in plastic wrap to chill for 1-2 hours. When ready to use, roll dough out and put into your pie dish. Crimp edges and prick the bottom with a fork. Chill for another 30 minutes. Preheat oven to 350 degrees. Place pie weights in the bottom of the crust. Bake unfilled pie crust for 30 minutes. Continue with recipe above for quiche. Do you know where he got it?